Limited Edition of 1500 prints 20"x 29", 2000. After the success of my English cityscape prints I was persuaded to visit one of the world's most beautiful cities and see if I could do it justice with a Sydney artwork. Landing in Australia for the first time, in February 1999, I immersed myself in the city (and its humidity) over many days studying the Sydney cityscape. 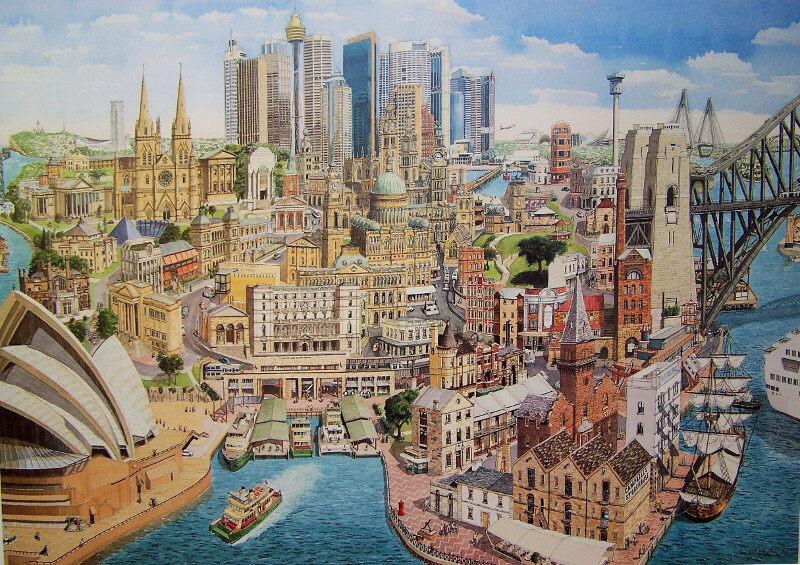 As usual I tried to walk every street around the centre in search of suitable subjects for inclusion, this also assisted me in gaining my orientation in the city, which was vital to the composition of my Sydney painting. From the magnificent Opera House and Harbour Bridge to the historic Rocks and Macquarie Street buildings, to the varied landmarks that make Sydney what it is; like the Luna Park clown, il porcellino, Mrs Macquarie's chair, and even the giant crane on Garden Island. Not forgetting the influence of Port Jackson with its changing colours and the constant movement of ferries, boats and ships of every kind. All this had to be considered for inclusion in my Sydney art print along with the growing Olympic complex at Home Bush Bay! Normally these would be the subject of many Sydney paintings, but I had to view it as one entity. When I had gained sufficient information on this vibrant place to tackle a painting of Sydney, I headed back to my studio in England, loaded down with hundreds of photos and dozens of books and plans. Gradually, over many months and regularly working late into the night, I created the ink and watercolour painting from which the Sydney art prints were produced. Stuarts Originals, Bron y Garth, Llanbedr, Gwynedd LL45 2HT, UK. Copyright © Stuarts Originals, 2000 - 2015. All rights reserved.